This item requires action within a limited time frame. Please see Product Description for details. This electronic delivery of an Aluminum Print Ordering Kit from Aluminyze allows you to order a 12 x 12" aluminum print with a easel mount. It includes a coupon for ordering a 12 x 12" print . By visiting the Aluminyze website you can easily upload any photo and choose from a wide range of options for your print. However, the image must have a minimum resolution of 1,200 x 1,200 with the recommended resolution being 3,600 x 3,600. Mounting options vary and can be either a wall mount, easel, or acrylic pedestal depending on the size of your photograph. Following this you choose between a white or raw silver surface and either a glossy or matte finish. This also helps create the vivid and vibrant colors brought out by the aluminum. Aluminyze uses a dye sublimation process to produce the images. This infuses the image into the aluminum to create a durable print. 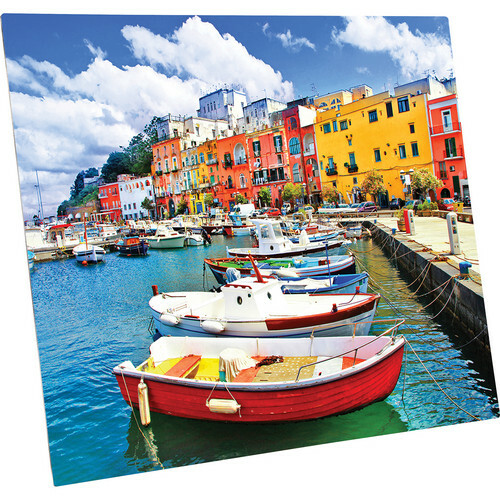 The benefits of aluminum are a sleek, frameless print that is resistant to fading and environmental conditions. This ensures the longevity for your photographs. The included coupon is valued for a 12 x 12" print but can be applied to any combination or type of Aluminyze products. Also, the code must be redeemed within 90 days of purchase. However, the print can only be shipped to US and Canadian locations. The dye sublimation process and aluminum metal infuse to produce a highly durable print that is scratch and UV light resistant, along with being waterproof. Size options range from a small 5 x 5" square to a 24 x 30" rectangle, with specialty options like panoramas and shapes, like circles, ovals, hearts, and others. An easel mount is suitable for smaller prints, like 8 x 10", and allows you to place the image on a table with your other framed pictures. The wall float is useful for large prints and will hang on a screw or nail, floating your image 1/2" away from the wall. A few sizes of acrylic pedestals are available for a simple approach to presenting your photograph. Both matte and glossy finishes are available. The glossy finish will provide a reflective image with a lot of brightness and color while the matte finish will soften the tone of the photo and reduce the reflectivity of the print. A choice between a white or raw silver surface is available. A standard white backing will ensure contrast and saturated colors are maintained in your print while a raw silver surface gives a metallic toning and semi-transparent look. The silver surface is ideal for black and white images and colorful photos because it can create a very bright image with a three-dimensional feel, but highlights can wash out and portraits may not produce ideal results. These orders will ship within 2 to 5 business days and include free shipping from the manufacturer. However, this item can only be shipped to US and Canadian locations.